Of all the public service institutions, the police are among the most controversial. In Kenya, as elsewhere, police remain encumbered by complaints of malpractice, excessive use of force and corruption. The result is ‘conflictual’ police-civilian relations, especially in the case of minorities, who see the mode of application and administration of justice as selective; police are also viewed as having unaccommodating gender views. 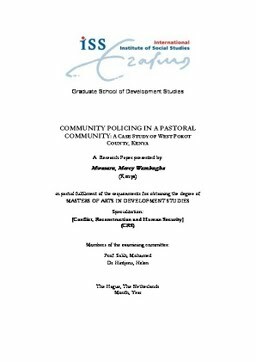 This research paper is an attempt to interrogate how the implementation of Community Policing Principles took place in a pastoralist community. A long-standing history of cattle rustling and more recent introduction of small arms and light weapons are important characteristics of West Pokot County. These are said to be behind police illegalities, illegitimacies and excesses. By cross-examining the policy environment which guides policing of citizens, it is intended that this research will expose how the interactions of security discourses with societal organisations and gender relations in this county has served to make the locals security achievement an illusion. The research findings address problems in implementation, including a lack of a common purpose among central coordinating organs in relation to Community Policing by various security agents. The result in West Pokot has been to worsen community divisions; Community Policing was found to have failed in efforts to strengthen security within and among West Pokot County communities. Therefore, the study suggests that for Community Policing to be fully operationalised, wakasa (elders), ngoroko (Moran), and women especially must be part of any successful strategy of Community Policing in the region. There is a need to develop an alternative approach to community policing aimed at a broader understanding of security, where police engagement is not limited to helping local communities fight criminal insecurity.